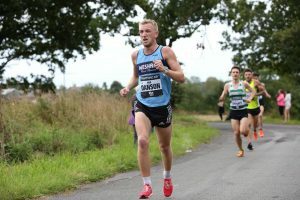 There was a quality field in the re-scheduled Trafford 10k with the first three finishers running under 30 minutes, and Rob Danson placed 11th with a time of 30:50 to show that he is back in full action. Rob went on to take the final Inter-Club race in Leyland’s Worden Park on Wednesday by storm and won by a big margin, sure to take the 2018 series overall win. Gareth Booth finished 3rd for Wesham and despite a good team with Steve Littler and Ugis Datavs and a great run from David Taylor the team slipped down the rankings. Full results next week. 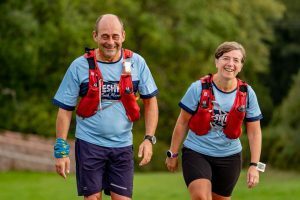 Chas and Angela Colby completed the 44-mile Grand Tour of Skiddaw on Saturday featuring 7136ft of climbing with the peak of Skiddaw reached at the halfway point. Team Colby finished 103rd (155th/156th) in a time of 12:38:47. In the Hunters 5k on Tuesday evening David Taylor finished 2nd in 17:46 with a great run with Steve Abbott 5th in 18:32 finishing 1st M40. George Kennedy was 54th in 25:55 coming in 4th M60 and running with Suzanne Leonard who was 15th woman and 1st W45 with the same time. James Mulvany finished 2nd in the Golden Ball 10-Mile race in Lancaster, clocking 61:48 on an undulating course, placing 1st M40. David Millar was 32nd and 2nd M45 in 1:27:07. Dave Young finished 3rd M70 in the RAF Cosford 10k on Sunday, finishing 196th overall in a popular race run entirely around the grounds of the airfield in 53:03 and a chip time of 52:52. In the hilly Garstang Half Marathon on Sunday Paul Lancashire ran 1:46:53 to finish 39th and 5th M35. Lee Nixon finished with 1:48:55 in 45th place and 6th M35; and Mark Dobson clocked 2:07:54 for 86th place and 11th M50. 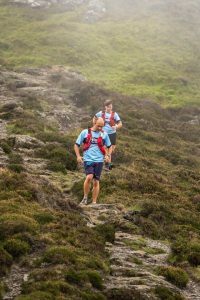 Carl Groome finished 5th in the Derwentwater Trail Challenge 15k on Saturday, clocking 1:16:44 for the run up out of Keswick onto Lonsdale Fell and Lattrigg. Helen Lawrenson finished 5th woman and 2nd Lady Veteran 40 in 1:30:40. Elliot Costello placed 60th in 1:32:20. Anne Berry was 313th in 2:03:37. Graham Brook ran the Trail 10k run and he finished 183rd in 1:05:56. 23rd M50. Finlay McCalman was 198th in 26th M50 1:06:48 in 198th. Vicky Gore was 214th in 1:08:47, and Sue Rigby finished 365th in 1:40:05. There was a good turnout of Wesham runners at the Lytham Hall parkrun on Saturday morning in great conditions for running. Matty Chamberlain ran the 3rd fastest time of the day with 19:50 to score an M45 age graded performance of 71.51%. Jonathan Lawson ran 21:33 for an M50 grade of 68.45% and Phil Leaver ran an M65 71.50% with a time of 23:27. Graham Cunliffe was right behind with 25:24 for an M60 64.24%. Stuart Topping hung on for 25:26 and M45 56.62% with Sharon Cooper 25:32 for W45 62.21%. Martyn Taylor ran 26:20 for M60 62.53% and Peter Rooney 27:07 for M55 58.64%. Kay Twist had 27:44 and W45 59.74% while Nicola Carter recorded 31:02 with a W35 grade of 48.34%. Sharlan Butcher ran 35:30 and W45 44.74% and Julie Topping 36:00 with W45 45.46%. In the Preston parkrun Steve Abbott had the 5th fastest time of the morning with 18:25 for an M40 age grade of 74.66%. Nigel Shepherd whipped round in 21:09 50 seconds short of his best for M60 75.81%. Robert Brown ran 25:21 for M60 63.84%. Chris Pike completed his 140th parkrun and 155th at St Helens with a good time of 25:48 for M40 54.13%. 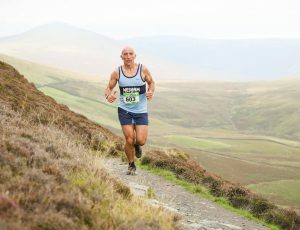 The travelling Gores were in Keswick prior to the Derwentwater Trail and Steven ran a new personal best time of 20:31 for an M35 grade of 65.07%. Vicky Gore ran 27:28 for W40 56.43% and Carl Groome ran 31:16 to pace out an M45 46.80%. Elizabeth Johnson took in the Glencarriff parkrun in County Cork, Ireland clocking 28:28 for a W35 53.40%. David Taylor ran the fastest time at the Blackpool Stanley Park run in a swift 18:05 for 71.71%. David Marsland clocked 24:09 for M60 67.56% and Jo McCafferey recorded 27:54 with W40 54.84%. Martin Allison ran 27:56 for M35 47.205 and Emma Wright 29:56 with W40 51.11%. James Birchall ran 31:02 with 41.62%. In Fleetwood along the Promenade Peter Cruse whipped along to 21:56 for M55 70.67% with John Burns ripping up the concrete with 22:36 for M60 72.86%. Rob Wallace raced along for 23:01 and 56.05% with Suzanne Leonard scorching to 25:32 with W45 64.10%, all good age gradings. Brian Jones ran 32:58 for M55 47.42%.